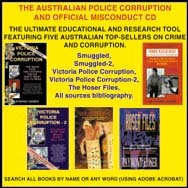 THE AUSTRALIAN POLICE CORRUPTION AND OFFICIAL MISCONDUCT CD. THE ULTIMATE EDUCATIONAL AND RESEARCH TOOL. FEATURING FIVE AUSTRALIAN TOP SELLERS ON CRIME AND CORRUPTION - OUT NOW!! AN ORDER FOR THIS AWESOME MULTIPLE BOOK CD ROM AND EDUCATIONAL RESOURCE TELLS YOU WHAT THE AUSTRALIAN GOVERNMENT AND IT'S COMPLIANT MEDIA DON'T WANT YOU TO KNOW. THE FIVE BOOKS FEATURED ARE AUSTRALIA'S NUMBER ONE UNDERGROUND BEST-SELLERS. THE CD ROM IS COMPOSED OF ACROBAT, MS WORD AND HTML FILES WHICH ENABLES AN INSTANT SEARCH FOR ANY NAME OR KEYORD - ENABLING STUDENTS TO INSTANTLY GO THROUGH THOUSANDS OF PAGES (OVER A MILLION WORDS) AND FIND EXACTLY WHAT THEY WANT. To order this CD ROM now click here.